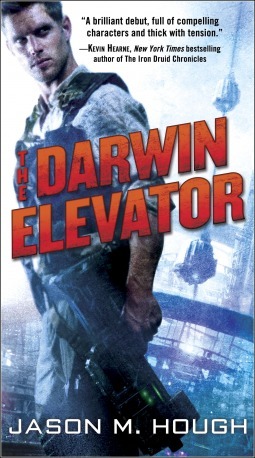 ‘The Darwin Elevator’ is the first in the ‘Dire Earth Cycle’ trilogy by Jason M. Hough, soon to be followed by ‘The Exodus Towers’ and then ‘The Plague Forge’ in August then September respectably. I first discovered this book by being interested by the cover and looking for more information – the first line of the synopsis certainly grabbing my attention.‘In the mid-23rd century, Darwin, Australia, stands as the last human city on Earth.’ Hang on – I live there. It’s a tiny place. I can probably count how many novels have mentioned this place, let alone been set here, on the one hand! I promptly contacted the author to ask why, why us! To be told that he simply looked on the map to find somewhere near the equator. Regardless of this, it feels as though Hough has done his homework. The places mentioned are real places here – Nightcliff, The Narrows, and Ryland is actually a main road, and Melville (the ship) is actually a nearby island directly above Darwin. The joys of the internet. Set mainly in the year 2283, the world has changed dramatically when one day, ‘The Builders’ arrived with a massive alien structure that descended into a remote part of Australia – Darwin, in the Northern Territory. Then everything continued on as normal, with no sight or sound of the aliens who bestowed such a strange ‘gift’ to the world. Until years later, a devastating and strange zombie-like plague tore the world apart, leaving only Darwin a safe and habitable place, thanks to a kind of safety zone (known as the Aura) created by the elevator. There’s a few dozen people immune to the plague who can travel out past the aura without the assistance of bulky suits. One is Skylar Leiken, and he has a small crew of fellow immunes, and a ship called the Melville. Together they travel around the world, on small and large jobs to whoever who can pay, for reasons they’ll happily oblige if the pay is right. However, the subhumans, as they’re called, seem to be changing into a type named the newsubs. And occurrences are breaking out in the space station which shouldn’t really be possible. One job leads to another until soon the fate of the entire planet and space station beyond is resting on Skylar’s shoulders. Thankfully he has a brilliant scientist, Dr. Tania Sharma, to assist. Overall, the novel is a solid read. There’s action and huge events taking place early on, the crew and characters in general taking devastating hits to the point where you wonder what could possibly happen to them in the last half – how could they possibly continue on. The science feels reliable, showing Hough has either done his research or simply uses the right words and writes with confidence – he has me fooled if it’s totally implausible. The female characters are varied and strong, Samantha especially, and I loved the rough interaction shown, punches and forehead bumps. The main issue, if any, could be with Skylar who sometimes seems just a little… lacking. We’re told he’s an amazing leader, but we’re not often shown why. He’s not overly charismatic or an excellent fighter or inspiring speaker, and yet I felt okay with him, perhaps with the reasoning sometimes we like seeing just an ordinary person having to do great things, and managing them through will and inner strength. I’ll certainly be looking forward to the next two, and anything Hough does in the future. This review was originally posted at SentientOnline on the 22nd July 2013.